The ZR1 produces momentous car-geek numbers: zero to 60 in 3.4 seconds, a 205-mph top speed, 7.26 seconds around Germany’s Nürburgring, 638 horsepower, and 604 pounds-feet of torque. To put it in context, there’s only a factor of 0.001 between the ZR1 and being punched full-on by Kimbo Slice. 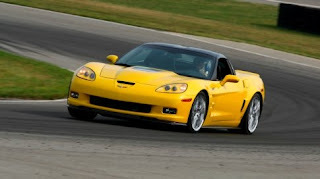 I have heard from a friend, that he ran a Z06 up to 200 mph, measuring his speed with an electric eye sensor. I suspect the ZR1 will do 205 pretty easily. Carbon-ceramic brakes from Brembo provide the kind of stoppage you’d expect from an arriving 737. These are the same high-heat-handling discs used in the Ferrari Enzo. Actually, as one engineer said, they’re the size of those on the track-only Ferrari FXX in the front and the lesser Enzo in the rear (did I just say “lesser Enzo”?). I wonder what the spec on the Spec V's brakes will be ? Ultimately, the 2009 Corvette ZR1 may never score a single kudo from kids with pictures of Lamborghinis and Elisha Cuthbert in their lockers. Japanophiles who deify the 2009 Nissan GT-R will go on posting put-downs on Internet fan forums. And Chevrolet engineers who worked the ZR1 program will still sleep soundly as kittens. Yes, the ZR1 is that good. Can't we all just get along? Actually I own more GM vehciles than Japanese vehicles. Well at least personally.